You have a bit of a learning curve ahead of you but I did find a post HERE that addresses many of your questions. The interesting part is about half way down the page. Spelt, like most whole grain flour, needs plenty of time to absorb the liquid fully. It also sounds like it doesn't take kindly to 3 rises. If you can set your machine to 1 rise before the final shaping and 1 rise after the final shaping, it should work. Also, more than one post about spelt tells us to rise only to about 1 1/2-do NOT double. An acid protein like yogurt or buttermilk also helps. scant half tsp of xanthan gum. warmed the wet for a minute in the microwave (milk had been in fridge). made a dimple in the top of the dry and added 2&1/4 tsp of instant yeast. Stretched out the loaf at the end of the knead during the shape option. 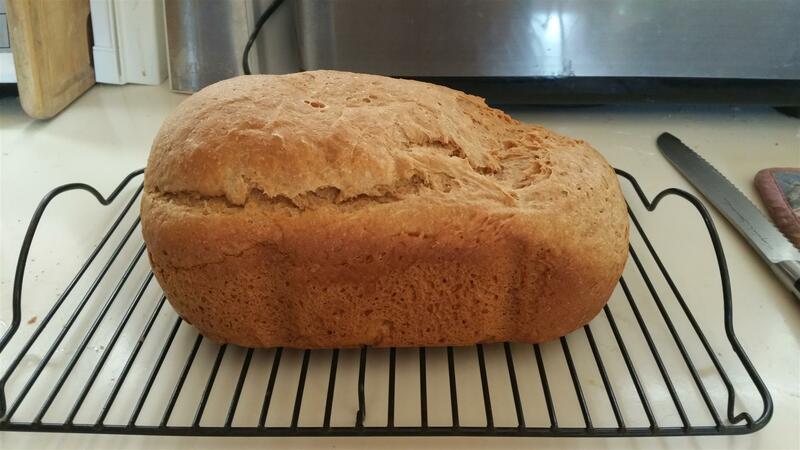 The result was delicious, but the loaf was small and a bit uneven in shape and, sigh, with a somewhat gummy center. Was the gummy center due to too much gum? Or too much liquid? The original Rx calls for water, should I not have used milk? Funny...everything speaks to how spelt bread is apt to be dry and crumbly, but I have achieved just the opposite first time out! What about using sunflower lecithin or buttermilk powder? I use these in the other bread recipes. What should I do for a bigger loaf? The bread isn't too dense, but I would like a bigger loaf. Just proportionally increase things by 25%? Is the way I handle the wet and dry ingredients and putting them in the pan OK for this bread? Or with spelt should I mix the ingredients and let them sit for a while for whatever autolyse magic is about? I have gotten the correct (active) yeast. First off, I'm not clear if you make the whole loaf,beginning to end, in the machine or just use the machine to mix the dough but then shape,put it into a pan and bake it in an oven by hand. I might change some of my recommendations depending on how you do this. It looks like you have addressed many of the things said about spelt and I'm sure you will get there. I have not worked with spelt but have worked with rye and whole wheat so I do get a sense of what they are talking about with spelt's idiosyncrasies. Doesn't buttermilk powder have lactose in it? If not, by all means, use it. It can only help the flavor and probably the texture. Or use the soured Lactaid milk. That is an old baking trick for when a baker didn't have any sour milk available. Gums- 1 tsp guar gum actually seemslike too much to me. So why the xanthan gum,too? I would add just 1/2 tsp xanthan and call it a day. Or just 1/4-1/2tsp guar gum but not both. 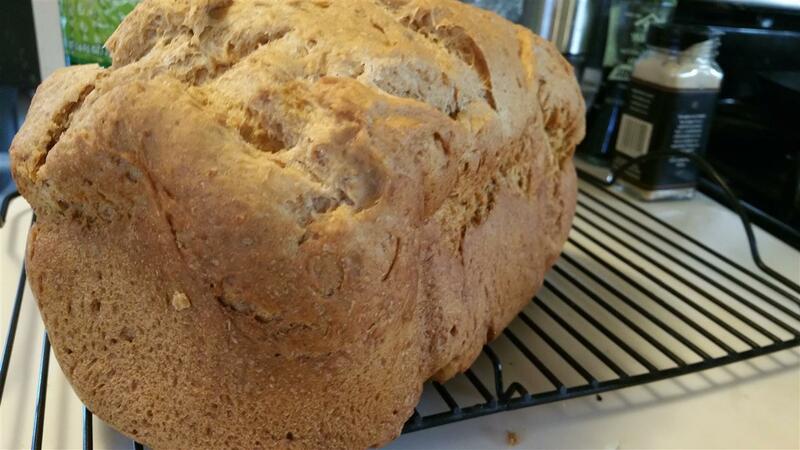 When I make GF breads, I use psyllium instead of the gums. I'd probably use about 1 tsp in this recipe. It helps provide structure in the same way the gums do. Ground flax seed and chia seed will also work. As far as how the wet and dry ingredients are handled, I believe you are constrained by how the bread machine functions. Isn't that how they instruct you to add ingredients? I wouldn't change that much if you are making the loaf in the machine from start to finish. Whole spelt does benefit from a good soak-minimum 30 minutes but a few hours is a lot better if you are only using the machine to knead the dough. Increasing the dough amount is always so much easier if you have a recipe by weight but this is a relatively simple recipe so it probably can work using volumes. Try it and see. I wouldn't increase the yeast. Remember this will probably be a bit denser than a white sandwich loaf and won't rise very high. Probably more like a 30% rye sandwich loaf. But the center should not be gummy. It would be very helpful if you could post pictures-especially of the crumb. It might be a fermentation or proofing issue that it turned out gummy. If it is overproofed, the bubbles collapse as the structure is too old/weak to hold it. It sinks in the middle into a bit of a gummy mess. If it is UNDERproofed, the bubbles don't form evenly-there is usually a dense line on the bottom of the loaf and up to the middle. Keep going. Sometimes it takes practice. My bread making process... I whisk together the dry ingredients less yeast. I mix together the wet ingredients having warmed the milk in the microwave (it was in the fridge and thus cold; this makes it warm). I pour the wet ingredients into the bread machine pan, then the dry ingredients. I make a dimple in the top of the dry ingredients (in the pan, atop the wet ingredients) and put the yeast there. I push start and the BM starts in with the knead cycle (no wait). Buttermilk does have lactose in it (and it thus out) and I am querying the maker of the buttermilk powder (about its lactose content). For now, I am souring lactose-free milk as per this. Next try this AM will be 1/2 tsp guar gum. Don't want psyllium or flax because of possible colitis aggravation. When you say "Whole spelt does benefit from a good soak-minimum 30 minutes but a few hours is a lot better", how is this done? Do you mix the wet and dry and just let it sit and then put it in the BM and start it? Do you only add the yeast after the soak? Is this autolyse? I switched to weight measurement way back, but did volume here because it seems like that's what so many people use and would expect. I wish my scale was sensitive enough to precisely measure the small amounts of light and fluffy gum! About making a bigger loaf: my question really was whether the fermentation process would support a bigger loaf or whether a taller loaf's weight would crush the bubbles. Since this is a Zojirushi Virtuoso, with a longer pan (thus the need for two paddles), this is less of a problem since "bigger loaf" is less tall than it would be in the more square pan that most bread machines have. 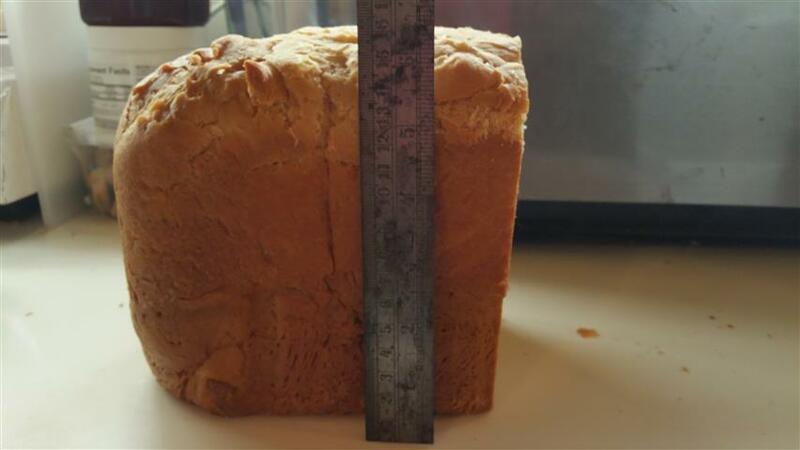 The loaf I got from my first try is 3.5" tall by 5" wide by 7.5" long. My BM was a great piece of luck...I got it used from a man moving to Costa Rica relatively inexpensively! I have more (hopefully focused) questions about the autolyse process. It also says that you don't want acid, but a neutral Ph, otherwise autolyse doesn't happen. You don't add the yeast because that makes it acid, preventing autolyse. But if I use soured milk/buttermilk as my liquid that would prevent autolyse, being acidic...so I can't use it if I am doing autolyse? I can see that after the mix and sit of autolyse, it talks about mixing the rest of the water and salt (otherwise it's hard to get the salt in and distributed) also with the oil and sugar/sorghum/rice syrup. But when and how do I add the yeast. Doesn't the salt kill the yeast? less gummy over all, but the center is still soggy. Next time cut milk from 1 cup to 3/4s and check.. I suspect the key may be in the proof time but a picture of the loaf and the crumb may help a lot in decreasing your number of "tries". Do you have a cell phone camera, a digital camera or iPad? Can someone who does email a picture to you? my spelt dough has been too wet every time, so you're not alone on that. Do a straight substitute with whole spelt but choose a quicker setting. I have done a blast of reading about bread machines, spelt and GF in bread machines for this post. Very interesting and some definite quirks. I have done enough rye ,whole wheat and GF to get an idea of where spelt falls in all this but I have not baked with spelt for "hands on" experience. I was hoping MiniOven, Hanseata or JeurgenKrauss or Dabrownman would chime in. I know they are spelt experienced. I hope by mentioning them they will be alerted. As far as bread machines, the consensus (googled) is that a BM is good for most but not all types of bread-there are tradeoffs and especially for GF or low gluten breads (like spelt). The Z-BM, with its Custom programmable cycles is the best to handle the tradeoffs. You should be able to get an adequate loaf for your daily bread and learn enough about spelt to develop a fantastic loaf and variations, if you want to. Set the machine to a short knead cycle-just long enough to make a shaggy dough. Add the ingredients in the recommended order as usual and when it is done kneading -TURN IT OFF and let it sit for 30-45 minutes. Your settings will be lost for this cycle and that's ok-you will just be using the full cycle when you turn it back on.Not exactly an autolyze but close enough. Don't worry about pH for this short an autolyze. That comes into play for much longer soaks. Turn the machine back on. Reset the knead cycle to the usual time you have been using and the 2 rise cycles and let the machine go through its cycles. That should be enough time to hydrate the dough. Check the shape of the dough before it bakes to make sure it is properly formed. Some reviews have said that sometimes the 2 paddle machines get dough caught in 1 of the paddles and resulting loaf is unevenly shaped. Psyllium is the same ingredient used in Metamucil-a medicine used as a bulk former in IBS and colitis. Review this with the appropriate experts and see if it would be beneficial to use in bread and baking. Metamucil has flavoring added so I buy plain psyllium at a well-stocked grocery store (Whole Foods). Generic unflavored Metamucil can be used but is generally more expensive. If you buy "Powdered" psyllium-use MUCH less. It is finely ground and more potent as a gelling agent. It is finely ground like cornstarch. An alternate idea is to mix the dough and then take the whole pan and put it into the refrigerator overnight. Take it out and let it sit for 30 minutes before putting it into the BM but ADD the REST cycle so the dough warms up before it is mixed again. Spelt should not sit too long to warm up-45-60 minutes max. Disclaimer: This is an off the cuff recommendation-no experience attached! It looks like the smaller loaf may be because the pan is not filled. Regular bread recipes for your BM have about 6 cups of flour and the GF has only about 3 cups. By all means increase the amount but I wouldn't double it. It may not be able to support its own weight. Think "Angel food cake" . The attachment of the dough to the pan sides helps hold it up as it bakes and then as it cools. Cool it completely in the pan for the highest crumb. 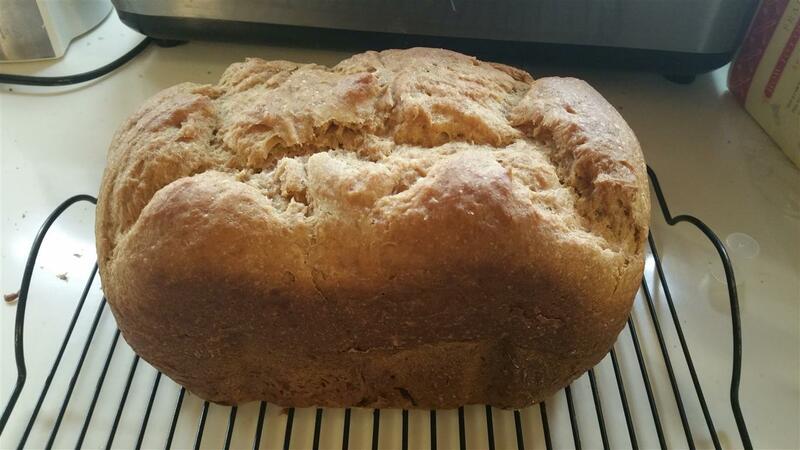 Adds structure (the protein) as well as moisture (the yolk) to GF or low gluten breads. If you add an egg, reduce the liquid slightly. (an egg is 70% water). Have you considered using Stretch & Folds instead of kneading hand-made bread? The physically hardest part of making bread is the mixing and then the kneading of the dough. I have hand issues, also, and so I use a Kitchenaid stand mixer to mix the dough and S&F (stretch and folds) for any additional "kneading" or strengthening. Another idea and tool to add to your toolbox. Batter breads- an old variation of bread. When I had to have hand surgery (both hands! ), I discovered Batter Bread. It is just how it sounds. It is mixed in a mixer and is about the consistency of a thick cake batter. Plop it into a loaf pan, raise and bake. I was able to do this the week after my surgery with the help of gravity and a good spatula. A little different crumb consistency than a kneaded dough but delicious and more than adequate for daily bread. Red Star yeast had MANY recipes. I'm sure they can be made GF or even with spelt. It is much easier to handle the dough. So a few more things to try. Pictures would be helpful! The loaf fresh out of the bread machine. Looks great! But it was very soft, and in trying to cut it then, it got flattened some. Some have suggested cooling in pan, will try that the next time. Also I begin to understand that the dough is too wet...wetness or too-wetness manifests and behaves differently with spelt than it does with wheat. Will cut the wet to 75% and then maybe cautiously add in more next time. Also, will try about a quarter or a third bigger Rx to fill the pan better. Nor would I know how to make it in bread machine but Spelt Challah is really very tasty. If you can perfect a recipe with these ingredients you'll have a very tasty loaf. Nice to have a quick alternative. This looks delicious and is very quick. If you use a non-dairy milk, you have to add an acid component so the soda will raise the bread. A tablespoon of lemon juice or vinegar (apple cider may have best flavor) will work nicely. The pictured loaf looks pretty good. 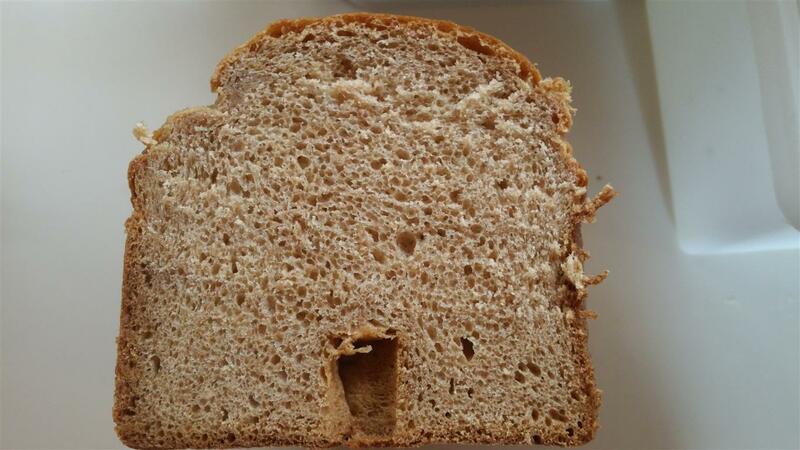 If spelt is like rye or GF you should wait until it is cold and even 4-5 hours old (minimum) before slicing. The gum structure needs a little time to distribute the moisture and 'set' properly. With a bigger Rx, less moisture and guar gum, plus a Q&D autlolyse (just a minute of mixing of all ingredients, then a 30 minute wait). Read some more on autolyse. Here's my ideas for try #4: put the spelt flour and soured milk (with a bit reserved, maybe 2 of the 9 ounces) and run the machine in any setting briefly, just to mix together the flour and liquid until shaggy. Wait 30 minutes for autolysis. I mix the yeast and salt into the reserved sour milk, pour it into the machine along with the honey and start my custom cycle (14 min: knead; 50: 1st rise; 20: 2nd rise;3rd rise, 0; 62, bake). But I thought yeast was to be kept separate from the salt, lest it kill it. use an ounce of the reserved milk to mix with the yeast, put that into the kneading cycle, wait a minute and then put the other ounce with the salt mix in into the knead cycle? Or what? Did a quick & dirty everything in the pan autolyse...knead for a minute or two until "shaggy", whatever that means. looked like this....is this shaggy? After 30 minutes, set the machine going on the custom Home Mode cycle (14 min: knead, 50: 1st rise, 20: 2nd rise, 3rd rise, 0: bake: 62) The (25%) bigger Rx loaf turned out well, filled the length of the pan and rising to 5"
I did shape the dough after the knead to fill the length of the pan...it was centered in the pan. Next time, I'll try leaving it alone and seeing if it doesn't expand towards each end....if that works I should get a cleaner looking loaf top. it still has a somewhat moist and slightly gummy center. When I cut it, it is a near thing that the knife almost grabs the center and compresses rather than cutting. A sharp knife works better than a serrated one, and I have to keep sawing lightly, I can't bear down. Also plan on a real autolyse using the pointers from clazart123 for next time. Comments or suggestions? 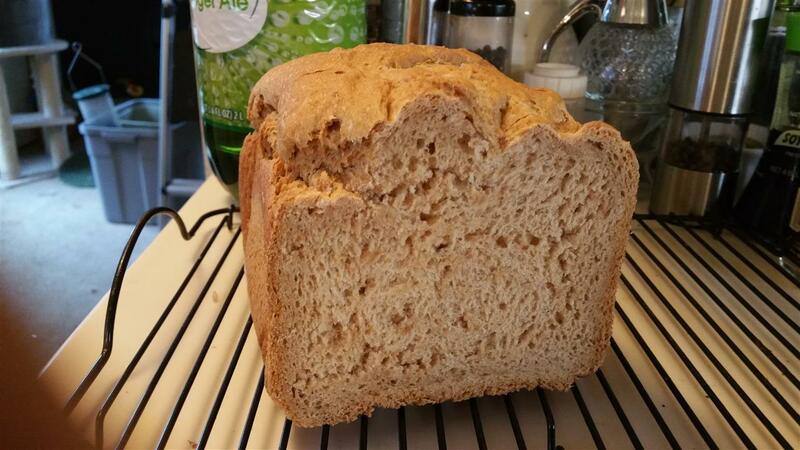 I think this worked out pretty well; I'm beginning to get to the sweet spot of making bread with spelt flour. Spelt dough presents altogether differently from wheat dough. Spelt has a funny almost creamy plasticity when in the rise. And the point at which the dough goes from too dry to too wet is much more abrupt. Wheat is much more tolerant of baker clumsiness and ignorance. But I love the taste of spelt. Toasted with butter, super yum. Dissolve the yeast in a tbsp. of water if it is Active dry yeast and add after the autolyse. Reduce the buttermilk by this same amount. If you are using instant yeast, there is no need to dissolve. It can go right into the mix dry as it doesn't need activation. Honey, in intimate contact with yeast, will also decrease yeast action. Add it wherever you added the salt. As long as the yeast is not in intimate contact with a concentrated or dissolved salt, it will be fine. Ultimately, yeast and salt co-exist in the dough without problems. "Shaggy" Yup! That's shaggy dough-barely mixed and some dry flour possibly left. Hydration Actually, you dough looks a little dry to me. You might want to increase the amount of liquid just a bit. If you weigh your ingredients, we can figure the hydration level and it is easy to adjust. If you use volume measures-"a healthy splash" more of liquid should do it. Slightly underproofed (What affects proofing for this dough will be hydration and guar gum. The temp is pretty well controlled.) The straight-on crumb shot is very helpful. It looks like the dough is just a slight bit underproofed. 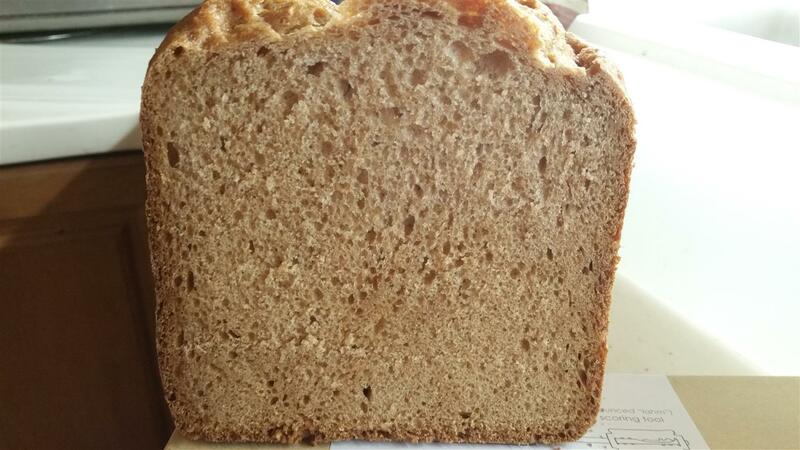 You can see an increased density at the bottom and up the sides of the crumb and a big oven spring. 1. Don't change any ingredients and increase the 2nd rise time 5 minutes. 2. You can slightly increase the liquid and keep the 2nd rise time where it is at. If the dough is more extensible (by being wetter) it may proof in less time. 3. Leave out the guar gum but don't add more liquid. If you leave out the guar gum and don't add additional liquid, you will be effectively increasing the hydration because the guar gum is not there to absorb it. Leave the 2nd rise time where it is. 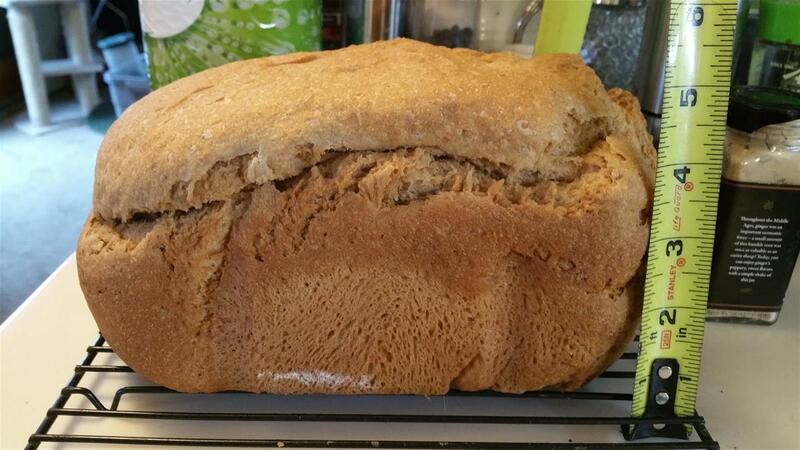 Your loaf definitely needs shaping and here is where my INexperience with spelt comes in. SPELT EXPERTS, please make any corrections necessary!. I know spelt does not like a lot of handling but after the first rise, I would remove the dough from the machine and shape into a loaf. Gently pat into a rectangle slightly larger than the pan, fold in the sides and roll up. Pinch sides, fold them under and place in the pan. Do not be rough and do not degas a lot or you will end up with a brick. After the 2nd rise, slash the top of the loaf so you don't get the bursting you see at the lip of the pan. 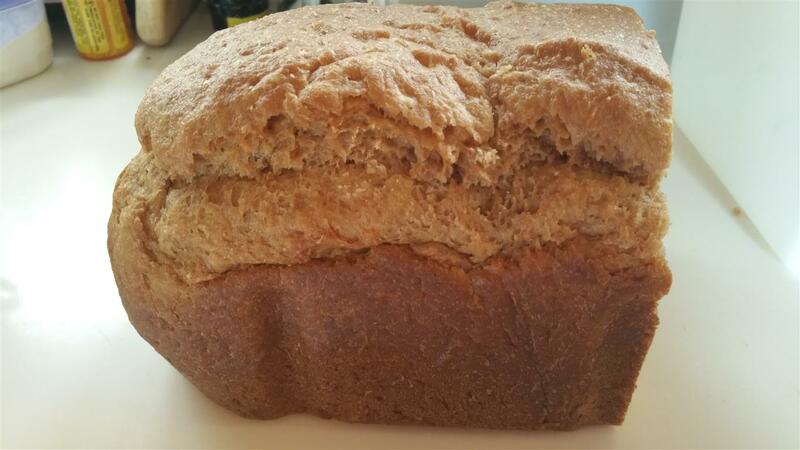 A good slash down the top will allow for great expansion and a nicely shaped loaf. Looks like great delicious fun! I wish I were there to taste! Glad I took a shot of the sliced end...c123 points out the structure that I hadn't seen. Pictures are better, aren't they? If you need more explanations, just enter "shaping " into the search box here on TFL. Lots of help. That loaf is not far off on the proofing and spelt goes from adequate to overproofed very quickly! KingArthur has a video here. THIS is TFL posting by JMonkey that used to include a video but apparently you have to view it on YouTube now. HERE is a youtube by JMonkey (a poster here on TFL). There are many ways to shape but this will give you the idea. 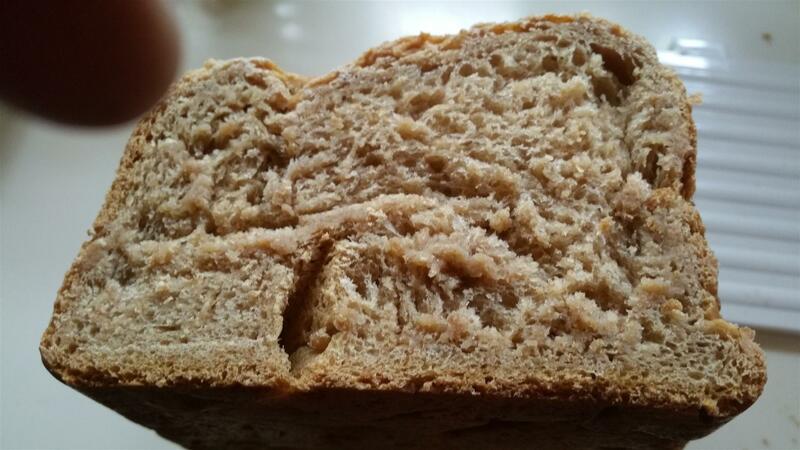 If you feel adventurous, THIS LINK has a recipe for a spelt loaf using an exotic sounding but actually simple technique called "tang zhong". It is a way of softening a loaf (esp whole grain). You cook and cool a gel of some spelt flour and water and add it to the dough. Very easy. Kind of provides a gum structure like the guar gum would. It may be simple (just sub the dairy out) or it may be another learning curve. Have fun! Good rise and texture (I think) Didn't have a scoring tool and forgot besides. My wife (who has IBS and was told to go on a FODMAP diet....no wheat but 100% spelt bread OK) said amazed, "it not only tastes great, but it's good for sandwiches and everything!". Made with soured milk, no gum...the dry, crumbliness some talk of only sort of appears when the bread is toasted. When I get this down to a crank-turning process, I will post the Rx. made a slurry of the active yeast with a tablespoon of water as suggested by clazar123. Alas that wasn't enough liquid...what I got was hard yeast mud...had to add 2 more tbsp and even that really didn't do it. Poured that over the dough ball and began my custom Home Mode cycle. After two minutes to get the yeast mixed in, I added the salt mixed into water and then about a minute or two later, the sorghum and olive oil....and ended up being way too wet. Had a rather stiff core dough ball and bunch of goo. During the 14 minute knead I fought to get the goo fully worked into the dough ball, which was then way too loose. Sprinkled flour over the dough and manged to get what I think is the right hydration just before the knead ended. Whew! Comment: the right hydration appears to be at a knife point between goo on the pan bottom and none, yielding a cohering plastic dough ball. At this point I thought I'd end up with education, but nothing much edible. Now that the knead had finished, the ZV gave me a chance to shape the dough. I took it out onto a board, but shaping proved impossible as the dough stuck to everything and besides, it didn't have any body, it was just a blob that I could not shape. I put the dough back into the machine and closed the lid, restarting the machine. After the 1st rise (50 minutes), the ZV again stopped to give me a chance to shape. I wet my hands and just smoothed dough out from the center to the ends. The dough is very plastic. There was relatively little rise and when I smoothed the dough, I hit the top of the paddles under the dough. IIRC, after the second, final rise, I was disheartened to see the dough had hardly risen at all and was resigned to having what was called "clunk" bread in my long-ago hippie days. Some how the dough rose during the baking cycle and I ended up with a respectable 4.5 inches. I kicked myself for not scoring it as it burst again. The autolyse was crazy complicated and fussy. Wondering how do get the dough wet enough for autolyze and yet add the oil and sweet and salt later without ending up too wet? Can the autolyze happen if the dough is really rather dry and there's even flour on the bottom of the pan? Apparently something happened to create a hard dough ball that didn't want to incorporate the follow on oil/sweet/salt. Suggestions on how to handle this? When I don't autolyse, the mixing happens easily right from the start and the consistency is pretty close to right. If the autolyse can be dry, I could reserve some liquid, mix the yeast, sweet and oil together, then add the salt later. Will the yeast have a problem encountering the soured milk's acidity? That way there would be enough liquid to dissolve the yeast. The Baking With Spelt tip sheet is very insistent on using active NOT instant yeast...but I have to wonder if, since instant yeast can be mixed right in, it wouldn't work better with this situation of adding stuff later after the autolyse... What say you? Try some lecithin? I use it in all my other recipes.. Thanks for all the help!!! I'm really amazed that this is turning out so well. Well, it looks like you are doing a lot of stuff right. 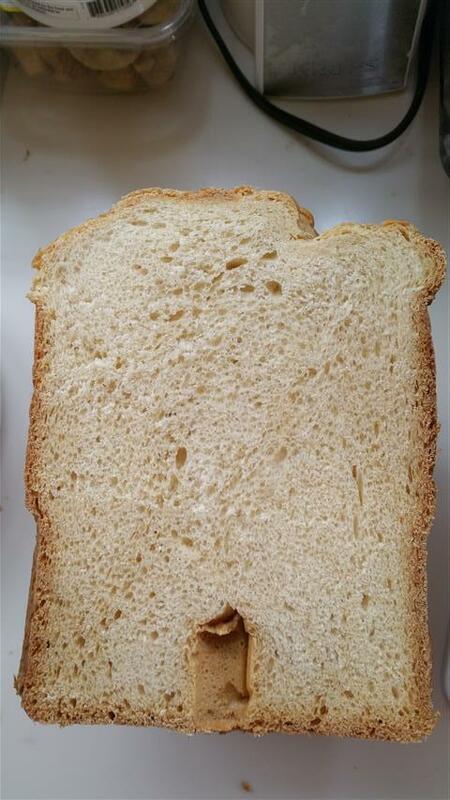 Despite the shape, the crumb on that loaf looks very good. We have come a long way and it would be good if you actually share what your recipe is for this loaf before I can make recommendations on changing it. Technique I can comment on. Instant yeast- I was hesitant to suggest instant yeast because I was under the impression that bread machine instructions emphatically stated NOT to use (from my only bread machine experience when my mother got a machine 40 yrs ago!!). Was that a wrong idea for current bread machines? It would certainly make it easier to just sprinkle the Instant yeast into the flour at the beginning or any point you wish in the process. Salt- does not have to be dissolved in water, it just makes the distribution easier when adding it to an already mixed dough. Salt has an impact on natural levain (can decrease its activity). It can kill commercial yeast if it is in intimate contact in high concentration (just put the yeast in 1 corner of the bowl and the salt in the other before mixing is adequate protection of the yeast), and it can inhibit the formation of the natural starchy gel (and windowpane) formation. It can be sprinkled over the dough at the end of the mixing phase but don't forget to add it and also make sure it is adequately mixed in. Adding guar gum? The gums are for adding structural support. Your loaf looked well supported-structurally- so I don't see a need looking at this crumb. Lecithin-I have used in the past. Certainly add if you wish. 1.To get the flour grains wet so the gluten strands (if any) can form. They will do this just by coming in contact with water. Kneading/mixing just gets more flour particles in contact with water to "develop" the gluten. 2. To wet the starchy gel and get it to ooze out and form a dough that can trap the CO2 gasses. I believe this is why we REALLY knead dough-to develop the starchy gel. This gel is harder to elicit in the presence of salt (hence the recommendation to add salt after achieving windowpane) but can be done. This gel is essential in trapping the gas and forming a soft texture. Take a scissors and snip the hard dough into golfball-sized pieces and then mix in. It won't harm the dough. This guy (Bob S ), has an interesting way of making bread called the "Remix" Method. His loaves are beautiful and I wonder if this simple idea would work for you rather than autolyze. The Baking With Spelt tip sheet is very insistent on using active NOT instant yeast...but I have to wonder if, since instant yeast can be mixed right in, it wouldn't work better with this situation of adding stuff later after the autolyse... What say you? I have always used instant yeast in my other breads, but the spelt baking link (at the beginning of this paragraph) was very firm about using active yeast....without explaining why. What I gather from clazar123's reply and the remix he points to is that the only ingredients that need to be reserved from the autolyzing process are the sweet and salt. So I will try that, since it will mean adding less liquid after the autolyze and will get more liquid to the flour during the autolyze, which hopefully should cause the core to be less hard. But should the yeast be present during the autolysis process? Or is remix taking the place of autolyze. I believe the re-mix method is supposed to replace using an autolyze. Yeast-King Arthur site says you can use Instant Yeast in a bread machine but that you should cut down the amount by 25%. Using Instant Yeast (lesser amount) and the Remix Method may make your process easier. Keep the settings the same for now. If you want to reduce the 7g yeast by 25% then just put in 5.25g or about 1 3/4 to 2 tsp. Wow! Thanks for all the help, everyone....this 100% spelt bread is now as light as a commercial loaf and, of course, much more tasty, something I never thought possible in a non-wheat bread. I increased the Rx by 20% to produce a two pound finished weight loaf. I botched scoring the top (more on that later) but the loaf didn't burst this time, so the end result was a light loaf, 5.25" wide, 8.75" long and almost 5" high. The loaf is light.airy enough to be fragile, i.e. you have to grip it lightly when picking it up, lest your fingers sink into the sides. My partner made french toast with it! Your comments on the texture of the end slice? Does it seem like I got the hydration right? Because of the above, it didn't score well with the lahm, which I did after the second rise. I'm thinking now I should score about 10 minutes or so into the baking cycle. • Measure out the flours and lecithin and whisk them together. • Microwave the Lactaid for a minute, add a tablespoon of lemon juice, stir and wait 5 minutes. Stir again. • While this is running, weigh out the salt. • Remove the pan from the machine and put on the scale, measure in the oil and sweet. Mix the salt into some water or milk, mix and pour into the pan. Return pan to machine and close the lid (which will restart it). Work it (intermittently open the lid and work the goo and dough together with a plastic spatula) to get these new ingredients into a homogeneous (and rather gooey wet) dough, maybe 2-3 minutes, then add .5 oz flour and see if that brings the dough to a proper consistency. Watch the remaining knead time because you have to get the hydration right before the 14 minutes of knead time ends! Pay close attention to the wetness of the dough...In general, it seems like if you have much dough cream or scum on the bottom of the pan (in addition to the dough ball), it’s too wet. Maybe you want that cream to just barely disappear. This time the risen dough was glistening. • Shaping: When the kneading phase is done, the machine will beep, the shape msg will flash on its screen. Ignore it this first time (at the end of the knead phase) and press the start button to advance into the 2 programmed custom rise phases. When they end, the machine will beep and pause, the shape msg will flash on its screen. This time, wet or flour your hands, then just smooth the dough ball out towards the end in the pan with wet hands. Press the start button to advance into the baking phase. That is a LOVELY looking loaf! I am so glad you persisted. Your partner is getting some deliciousness made with love. It sounds like your spelt dough may be very much like a 100% rye-the dough is more like play-doh than bread dough. I usually smooth the top with a wet, plastic bench scraper and then tuck the ends downward all around so it looks like a dome-shaped loaf when it finally bakes. Also, I wonder if docking it (poking holes with a wet toothpick or even the end of your food thermometer to about 2 inches into the dough) would be helpful with preventing a blowout. Congrats on a great loaf! My loaf this time. Things are getting more straightforward, less rushed and uncertain. This is 50-50 white and whole spelt flour mix, no lecithin this time. My loaves are moist (and prone to mold before they are eaten up) so left out the lecithin (which is siad to make things more moist...but supposedly also helps to prevent mold). Will probably put it in next time. I have a terrible more-must-be-better problem. 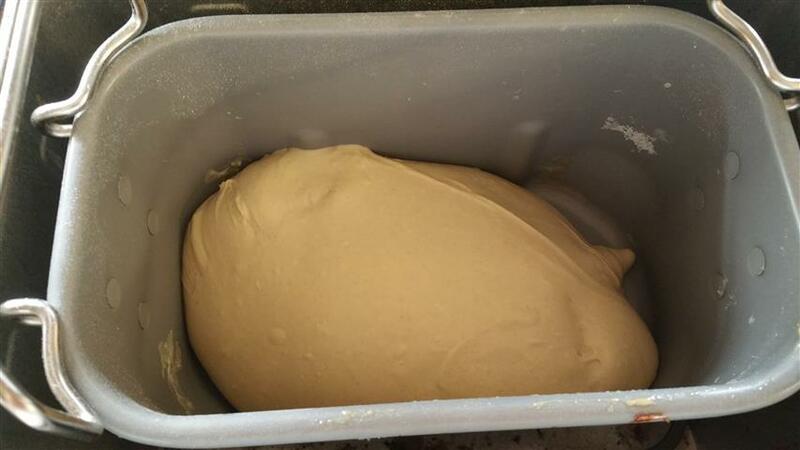 · Work it (intermittently open the lid and work the goo and dough together with a plastic spatula) to get these new ingredients into a homogeneous (and rather gooey wet) dough, maybe 2-3 minutes, then sprinkle the instant yeast over the dough ball. Close the lid and let the knead run for 1-2 minutes until the yeast is mixed in. · After the yeast is well mixed in (2-3 minutes), sprinkle the salt over the dough ball and let the knead proceed. Add water or flour to get the hydration right. 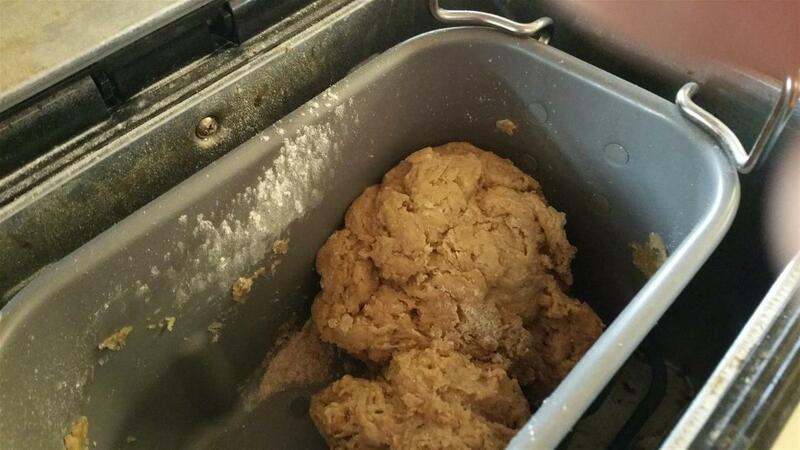 · There should be 3-4 minutes yet to knead to ensure everything is well mixed together. Watch the remaining knead time because you have to get the hydration right before the 14 minutes of knead time ends! Question: Some people use ascorbic acid (Vit C) or citric acid to discourage yeast. Anyone have comments about how much and how to use them? Just the opposite. In bread making one would wish to encourage yeast. And vitamin C does exactly this by making the dough a bit more acidic which is a better environment for the yeasts. It is also a dough conditioner. I have so enjoyed seeing the progress you have made on this loaf. Beautiful! Vit.c (or more correctly ascorbic acid) is used to provide a bit of acidity in the dough to make it a more yeast friendly environment and also to strengthen the gluten strands. If they are stronger, they will stretch longer while trapping the CO2 and the loaf becomes loftier. Ascorbic acid can act as a preservative, also. It would be interesting to see if the loaf lasted longer without molding. I keep my bread in a drawer in plastic and it seems to last longer. I also try not to touch the bread as much as possible while cutting or removing a slice or two. I keep the bag between my hand and the loaf as I cut and advance the bread as needed to cut the next slice. Our hands are a great source of mold spores. Got the VitaSpelt flour from Jet.com, 25 pounds for $43.85. My partner who has food allergies and for whom I bake this said something that made me think she wanted straight white with no whole grain spelt flour. It turned out, with the same fluids, to be much wetter than a 50-50 white/whole spelt flour mix. So I had to add a bunch more flour...and ended up with a very tall loaf, 6 & 3/8"! I find all white unbleached less tasty/nutty. My wife says she likes it maybe better this way. But it's too darn tall...barely fits in the slicer and too tall for the TWare 171 bread keeper. Used sunflower lecithin and Vit C (a pinch) this time.